Over the past couple years, Facebook has made a number of changes which have resulted in lower reach for business pages. While these changes have meant a better experience for Facebook users (the entire point of instituting them), businesses have been up in arms about the lessened reach which resulted. If you’re someone who has been impacted by a drop in reach, get ready. Facebook reach is about to drop again. But don’t get upset. It’s a good thing. Here’s why. Facebook just announced there have been some errors in their reporting and they’re making changes to correct them. They’re also making their metrics more clear. While one of these errors does involve the reporting of organic reach, the more important change is how they report this stat. Currently, Facebook reports organic reach differently than paid reach. Organic reach is measured by a person refreshing their News Feed and the post being placed in their feed. Under the current system organic reach is counted if the post is in their feed, even if they never scroll to that point of the feed to view it. For paid reach reports, a view was only counted if the post actually appeared on the person’s screen (“viewable impressions”). Measuring reach by actual viewing is a far more accurate way understand post performance, so this move to measuring organic reach in the same way that paid is measured is a great thing for marketers. Counting a post view when the post never appeared on the screen for someone to view it, gives an inaccurate picture of performance and seems a silly way to measure when we’ve got much more accurate means. This change will give marketers a more accurate view of performance but it will also mean a drop in reach reported. 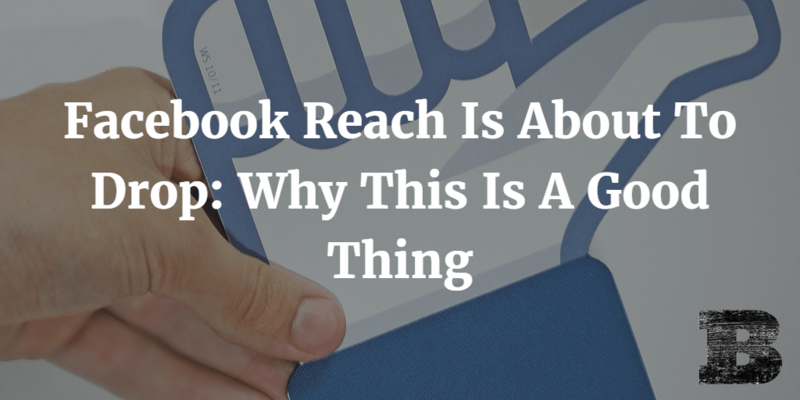 Facebook estimates reported reach will be about 20% lower on average once the change is made. Some will be outraged by this but remember that reach is an almost meaningless metric. Actual engagement is far more important than all the reach in the world. Facebook says these changes will be made in the coming months and they will provide an update to all Pages in-product and via their new Metrics FYI blog when it happens. Who cares if reach is about to drop? This change will mean a far more accurate way to measure Facebook success. Anyone that remains unhappy about this update is trying to show their success by an over-inflated and inaccurate metric. Be happy. We’ll soon be able to measure organic reach as accurately as paid reach has been all along.